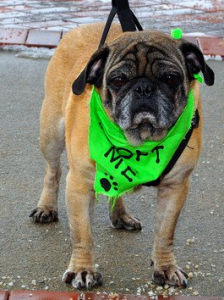 Jane is an apricot female pug who was born on Christmas day of 2004. Jane was a breeder release from Nebraska. She came to us weighing 25.2 lbs, but has lost some weight now that she is a lot more active. She has been spayed and is current on her shots. Saying that Jane is a super sweet pug is an understatement. She has really come out of her shell at her foster parents’ house. Actually, she is a bit of an attention hog. Jane has been really happy, and she has adjusted to life at her foster parents’ house well. Jane likes being outside. She will run around and play for a long time. She gets really excited when she comes in from outside, and tends to run around crazy for awhile. Jane is really good with Morgan, her foster parents’ 3 year old, and she has become close with her foster brother and sister. Jane has a little bed that she likes to lay in, which will go with her when she’s adopted. She likes to sit up on the couch, but will not jump up on furniture. Jane is still working on potty training. She has the basic idea down, but does not always make it outside. Jane is a bit protective, which shows in the fact that she barks at the door and sudden noises. She is also working on being patient, because she tends to get overly excited and impatient when it is time to eat.